The year is 1926, and Newt Scamander (Eddie Redmayne) has just completed a global excursion to find and document an extraordinary array of magical creatures. Arriving in New York for a brief stopover, he might have come and gone without incident, were it not for a No-Maj (American for Muggle) named Jacob, a misplaced magical case, and the escape of some of Newt’s fantastic beasts, which could spell trouble for both the wizarding and No-Maj worlds. KIDS FIRST! Film Critic Gerry O. comments, “It has been fifteen years since Harry Potter: The Sorcerer’s Stone was released. Now, 15 years later, we have a film explaining so many parts of the Harry Potter’s universe that will be loved by everyone who sees it.” See his full review below. It has been fifteen years since Harry Potter: The Sorcerer’s Stone was released. Now, 15 years later, we have a film explaining so many parts of the Harry Potter’s universe that will be loved by everyone who sees it. Fantastic Beasts and Where to Find Them is an extraordinary adventure. There are dozens of elements that help make this story so exciting. In some scenes, there are romantic elements between characters and fantastic comedy that will make anyone laugh. To make even picky viewers sit on the edge of their seat, the movie also offers spectacular action scenes. The story starts when Newt (Eddie Redmayne), a magizoolagist (study of magical creatures), goes to New York looking for a rare animal breeder. While there he accidentally gets all his magical creatures taken by a No-Maj/Muggle (non-magical person). It is now up to him and some new friends to get the creatures back. As they collect his creatures, they discover there is a grave danger to New York City that could threaten the existence of magical world. 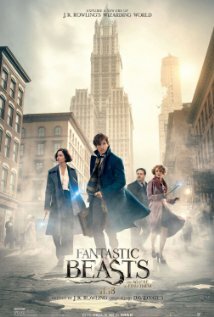 Fantastic Beasts and Where to Find Them is slightly different than the previous Harry Potter movies, although it takes place in the same universe. The story is much more complex than the previous movies. While the previous films all had individual stories, they also continued a continued plot about Harry Potter. Fantastic Beasts and Where to Find Them does not have that and instead begins and wraps up the plot in one movie. Since there are so many elements to the plot, things get slightly confusing. At the end, they reveal the bad guy. The problem is, we don’t really know he’s the bad guy. They don’t show at the beginning or throughout the film who the bad guy is and exactly what the he did. Throughout the story you are introduced to several antagonists and it feels like it is up to you to figure out who is the actual villain. The person at the end of the movie seems completely random. Although you can figure out, it is some evil villain based on how the characters are talking and you have no idea who the character is. If you watched the film two or three times, you might easily understand the story and, most likely, enjoy it much more. But, when you watch it one time, you might feel slightly confused and not completely understand what happened. A big perk about this film is the acting. Eddie Redmayne plays the main character and he is marvelous as Newt. Newt is a very quiet and an enthusiastic genius, which Eddie Redmayne excels at portraying, as always. The whole cast excels in their rolls, even if those with only five minutes of screen time. Something else I love about this film are the costume and set designs. The movie takes place in the 1920s and it truly looks like that time period from the police uniforms, to business men and even the children. Just like in the previous Harry Potter films, the cinematography and special effects are spectacular. There is a huge aerial shot of some sort of giant magical creature that looks so realistic it makes you feel you are in 1920s New York City along with the main characters. One more thing that could have been better is the sound. The sounds of monsters and creatures are spectacular and beautiful to listen to, but the actors’ dialogue is hard to hear at times. The actors often give very important information about the plot, but you can’t hear it because it is muffled by other sounds. My favorite scene is when we look inside the suitcase Newt brings with him. Just like many other things in this Harry Potter world, it is much bigger inside then it seems. Inside his suitcase “world” he has dozens of different magical creatures that he nurtures including some that are the last of their kind. His goal in his career is to write a book about magical creatures and the good things about them, since every other magical creature book discussing them focuses on how to defend yourself. That suitcase is his “workshop” of where he learns everything. There are some scenes that are either too dramatic, too intense or too violent for younger kids and so, I recommend it for ages 10 to 18. I give it 4 out of 5 stars because, despite having some issues with sound and storyline, the phenomenal acting, beautiful cinematography and unique visual effects make this film a very enjoyable one. On top of that, if you have never watched a Harry Potter film, or never read the books, you can still easily enjoy the story and understand the terminology. This film is in theaters now so, go check it out! Moana Waialiki is a sea voyaging enthusiast and the only daughter of a chief in a long line of navigators. When her family needs her help, she sets off on an epic journey. Joining her on the adventure is her hero, the legendary demi-god Maui. KIDS FIRST! Film Critic Mia A. comments, “Moana is a fun and creative movie full of adventure and heartwarming scenes. 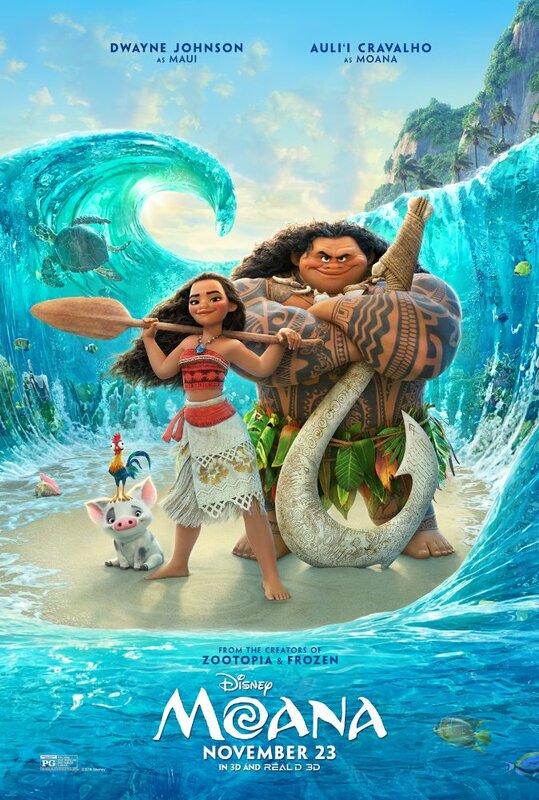 This is not the typical Disney movie because most of the original plots that are in every Disney princess movie don’t apply here.” Carka P adds, “I like this film because it shows how brave girls can be… Against her father’s permission, Moana has to leave her Village and embarks in an ocean adventure to save her people.” Arjun N. wraps it up with, “Moana is an excellent movie that is a colorful visual treat with lots of creativity. The voice acting, stellar animation and a good message impressed me.” See their full reviews below. Moana is a great movie! It is an original and creative movie by Disney and I absolutely love it. Moana is a fun and creative movie full of adventure and heartwarming scenes. This is not the typical Disney movie because most of the original plots that are in every Disney princess movie don’t apply here. For instance, Moana’s parents are still alive at the end of the movie, and she doesn’t have a boyfriend. It has a very unique plot. Moana is about a young girl named Moana (Auli’i Cravalho) who lives on an island in the Pacific Ocean. She is the chief’s daughter who loves the sea, but she is forbidden to go beyond the reef. She wants to have a better idea of who she is because she is torn between her village and the sea. One day Moana decides to go on a mission to find Maui (voiced by Dwayne Johnson) a demi-god to help restore their crumbling world. The animation is right on point. I appreciate the creative and very detailed animation because it helped the audience really get involved in and enjoy the movie. The water is animated incredibly well; it moved and looked extremely real. I also enjoyed the hair because in some animated movies, people’s hair doesn’t move. All the hair in this movie had body and went damp when it got wet. The islands have detailed grass and trees. In far out shots looking at the islands you can see all the trees with their leaves and the ridges on the rocks and cliffs. The animation looks a lot like real photographs. My favorite character is Moana. Moana is brave and confident. She follows her heart and stands up to people who think she is wrong. She would be a great role model for kids. The moral to Moana is “believe in yourself you can do whatever you dream.” Both Maui and Moana both don’t really know who they are. When they talk to each other and learn to like one another, they develop confidence and they succeed in fulfilling their dreams. I recommend ages 5-18 to see Moana because almost all ages that like Disney wukk like this movie. Even my dad enjoyed it and he is 60! There could be some scary parts for smaller kids, but nothing too bad. I give this movie 5 out of 5 stars! Go see Moana in theaters near you! I like this film because it shows how brave girls can be. 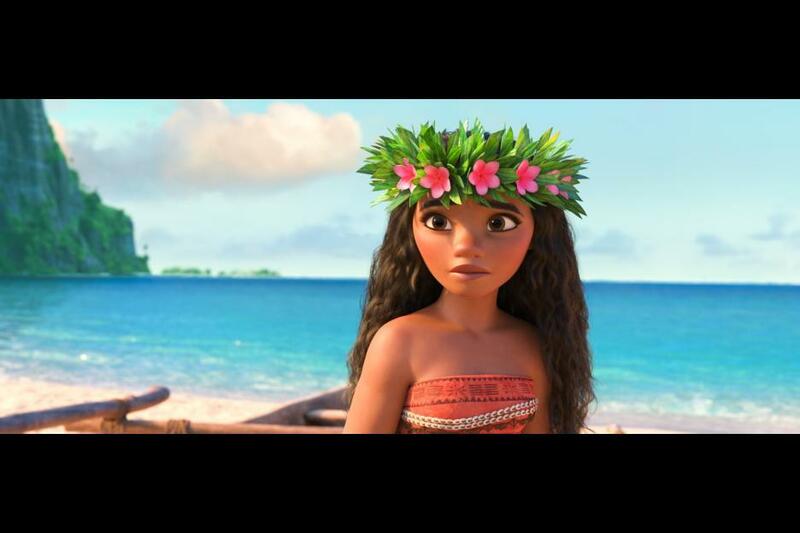 Moana is the daughter of the Chief of a Village in the Pacific Island who’s destined to become the leader of her tribe. 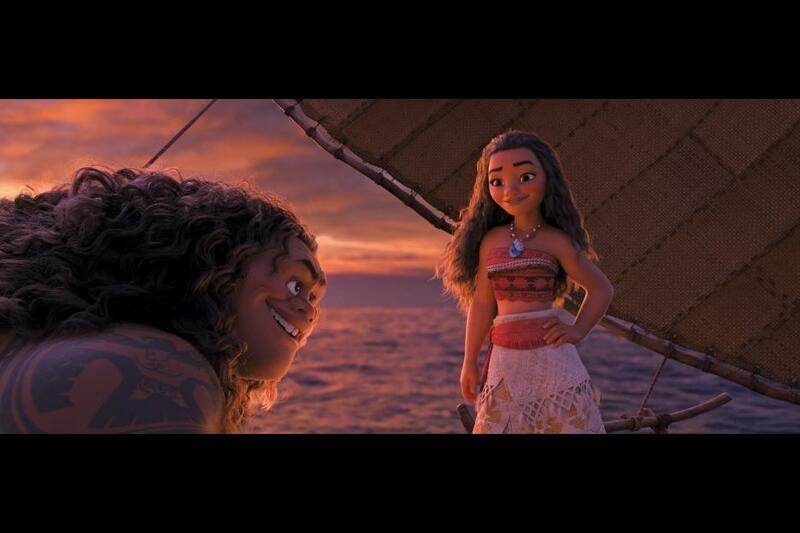 At a young age, Moana was taught by her Grandma to love the sea and she told her stories about how the islands were made. Moana’s father always told her to not go beyond the lagoon in the ocean since it’s dangerous. He was concerned about losing her. 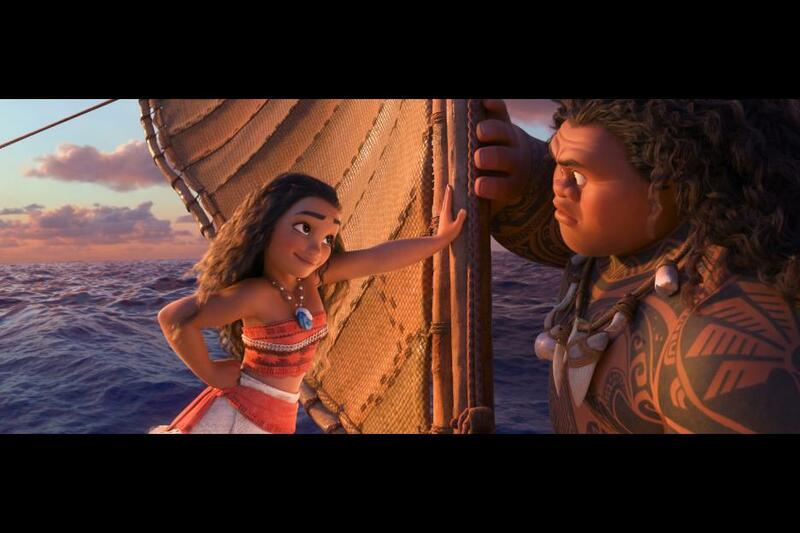 Against her father’s permission, Moana has to leave her Village and embarks in an ocean adventure to save her people. The demigod Maui took the heart of the maker of all lands Te Ka and Moana has to find him to give back the heart to Te Ka, otherwise their land is going to be ruined. Moana is produced by Walt Disney Animation Studios in a unique CG animation style that looks very realistic, like virtual reality. The voice over actors are all quite wonderful, especially Rachel House. I love how she portrays her character Grandma Tala because her voice delivers such grant emotion. 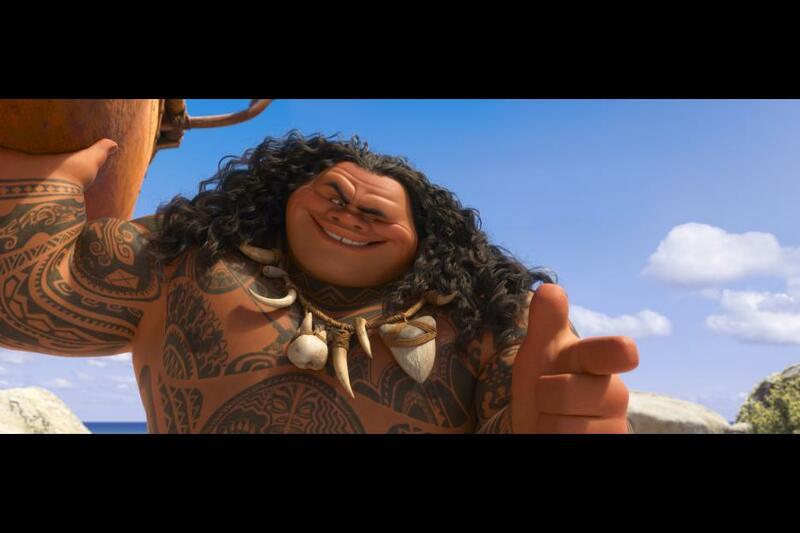 Also, Dwayne Johnson portrays his character Maui very well with a very adventurous tone. I like how they animate Te Ka with extraordinary animation effects. The writers really make this story about an emotional heroine quite a fantastic story. I got emotional when I saw this movie because of the relationship between Moana and her grandma. I commend the directors, John Musker and Ron Clements for delivering such a great film with outstanding visuals and sound. My favorite characters are Grandma Tala because she has so much faith in Moana. She doesn’t mind that people call her crazy for loving the sea. I also love Moana because she is very brave and courageous. I like how, even though her father is afraid for her she still goes to fight for her people. The message of this movie is to believe in yourself, follow your heart and fight challenges. Moana believes in herself when only one other person does. I give this movie 5 out of 5 stars because of its inspiring message. I recommend it to ages 6 to 18. This is the perfect movie to see over the holidays with family and friends. You can find this movie at your local movie theater on November 23! Moana is an excellent movie that is a colorful visual treat with lots of creativity. The voice acting, stellar animation and a good message impressed me. However, I didn’t care for the slow exposition. Despite this flaw, this movie is still a fun experience to watch. The story is about Moana (Auli’i Cravalho), the daughter of the respected chief on Motunui Island, wanting to venture out into the sea. One day, danger faces Motunui Island and Moana must go out to save it. Moana is chosen to reunite the Heart of Te Fiti, which was stolen by the legendary demigod, Maui (Dwayne Johnson). Moana teams up with the arrogant Maui in order to reunite the Heart of Te Fiti and both face various dangers. Auli’I Cravalho delivers an excellent first performance and steals the show as Moana showing her adventurous and determined side, distinguishing Moana from the rest of the Disney characters. It is surprising that this is her first performance because of how well she performs. Dwayne Johnson also steals the show in his charismatic and funny performance as Maui. Dwayne Johnson, as usual, puts his best work into his characters. Rachel House delivers an outstanding performance as Gramma Tala, who is important in Moana’s call to adventure. John Muskers and Ron Clements’s direction keeps the movie flowing from one place to another whether it is a lush island or the windy seas. The animation is some of the best I have seen, particularly the water effects. The bright colors of the various locations also impressed me. I have rarely ever seen a movie with such good use of colors. My favorite scene in the movie is the fight scene between Maui and a giant crab. I can’t spoil it, but it is uniquely creative. The movie is not all perfect. The exposition showing Moana growing up is a little slow and drags, but this is only 10 minutes of the movie. The rest of the movie is amazing. The movie has a great message about how Moana never gives up. She is constantly reminded that she can’t perform such adventurous tasks, but she always tries her best to face the challenges. I give this movie 4 ½ out of 5 stars and recommend it for ages 5 to 18 years old. This film opens in theaters on November 23rd , so go check it out. Just Keep Swimming – Finding Dory, Now on DVD/Blu-Ray/Digital HD is Fun for the Whole Family! After 13 years, Dory and Nemo return to the big screen and now is available on DVD, Blu-ray and Digital HD. The friendly-but-forgetful blue tang fish reunites with her loved ones and everyone learns a few things about the real meaning of family along the way. KIDS FIRST! 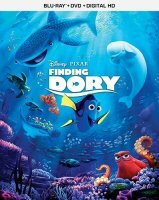 Film Critic Ryan R. comments, “I loved watching the brand new Blu-ray DVD Combo of Disney Pixar’s film, Finding Dory which is the sequel to Finding Nemo. Fans of Finding Nemo will absolutely love this sequel.” Morgan B. adds, “Who knows what this crazy blue tang fish will do. This movie is about overcoming obstacles and finding your way through life. Even though Dory has short memory loss, somehow she always finds a way to make it work.” See their full reviews below. I loved watching the brand new Blu-ray DVD Combo of Disney Pixar’s film, Finding Dory which is the sequel to Finding Nemo. Fans of Finding Nemo will absolutely love this sequel. The animations in this film are amazing, the humor is hilarious and witty, and the plot is so heartfelt. It does not disappoint. Dory, is a forgetful but fearless blue tang fish (voiced by Ellen DeGeneres) suffers from short term memory loss and she has struggled with this for her entire life. Then one day something happens to Dory that triggers her memory and she remembers that she has a family. She tries to find them with the help of Nemo (voiced by Hayden Rolence) and Marlin (voiced by Albert Brooks). The question is will Dory find her family, or will she forget to find them? In the Blu-ray DVD Combo, aside from having the actually film, there are many bonus features which talk about how Finding Dory came to be. In What Were We Talking About it shows us the difficult routes the filmmakers had to make a narrative that worked involving Dory and her short-term memory loss. There are also bonus features that have interesting facts about how this movie was made. For example, in Animating and Acting it shows us how the director, voice actors and animators worked together to make the animations and performances believable. Another thing that is included is a theatrical short called Piper which is about an adorable hatchling venturing from her nest for the first time to dig for food. Additionally, there are directors commentaries, deleted scenes (which are fun to watch), and many more. You can also use the scene selection option, pick what language you want the movie in, and play the movie. If you want to know more about these features, you should buy this Blu-ray DVD Combo. I love this Blu-ray DVD Combo because of its many features which are interesting and funny. My favorite one was called, The Octopus That Nearly Broke Pixar, this talks about how Hank was the most difficult Pixar character to create because it didn’t have the same formula as other Disney characters. They also explain how Hank took two and a half years to make, which is a long time since it usually takes nine months to create a character. I also like how it shows and gives an explanation of why the deleted scenes didn’t make the final cut. I give this Blu-ray DVD Combo of Finding Dory, 5 out of 5 amazing stars. I recommend this to kids ages 5 to 18 and I think adults might like this as well. I also recommend this to people who like action, adventure, animation, comedy, and family movies. You can find it on DVD/Blu-ray/Digital HD on November 15, 2016. “What would Dory do?” Who knows what this crazy blue tang fish will do. This movie is about overcoming obstacles and finding your way through life. Even though Dory has short memory loss, somehow she always finds a way to make it work. Hence “Just keep swimming.” This movie is available on Digital HD and Disney Movies Anywhere on Oct. 25. You can get the Disney PIXAR movie in Blu-ray 3D, Blu-ray, DVD and on On-Demand on November 15th just in time for the holidays. I enjoyed this movie but I thought it was missing the silliness and the humor of the first movie Finding Nemo. I found myself worrying and wondering rather than laughing and having a good time. At the same time it had a unique story line and the way it all played out was entertaining. My favorite new Character is Hank the septopus (Ed O’Neill). He is introverted while Dory (Ellen DeGeneres) is very outgoing and this combo was fun to watch. The fact that Hank also wanted to be in a small habitat in the aquarium and not in the ocean where he could be free was hilarious. The bonus features in this film include deleted scenes, crew interviews, and some screen savers. They were all fascinating and they all kept my interest. I loved the deleted scene (Meeting Hank) is when Dory fist meats Hank and he is trying to help Dory get to her parents, but they can’t find them anywhere. This scene was very quirky and I found myself laughing and giggling in two seconds flat. I liked this scene more than the one they used in the film because Hank was very silly and sarcastic. Then my favorite interview (Skating and Sketching with Jason Deamer) is when one of the animators was describing what he thought of as key points for all the characters in the film. I liked this scene because we actually got to see the shapes and objects the illustrator sees when he draws the characters. The way they showed this gave you a look into what he thinks the charters look like and gave us a different perspective. My favorite screen saver was the Open Ocean exhibit it was very colorful, playful, and fascinating all rolled up into one really cool clip. I love the flash back scenes were we learn about Dory and her back story. These scenes are my favorite because we see who her parents are and how she got lost. Jenny (Diane Keaton) Dory’s mom was very sweet and she just wants her daughter to be happy and not feel left out. Charlie (Eugene Levy) Dory’s dad is the kind of dad that everyone would love to have. He loves his family and he wants the best for his adorable daughter Dory who suffers short term memory loss. I had the pleasure of meeting Eugene Levy and his daughter and they are just sweet hearts and a fun interview. The adorable younger Dory (Sloane Murray) is just too cute for words. Her voice really matches the character because she sounds so childlike and innocent which made her perfect for this part. This movie is rated PG but I think younger kids will love the septopus, the seals, the beluga whale and all the new quirky characters. Some of the content is sad and serious and might worry a younger audience if they are sensitive. Just remind them you will always be there and you will never forget them. I give this film 4 ½ out of 5 starfish. You can find it on DVD/Blu-ray/Digital HD on November 15, 2016. Posted in DVDs Released | Comments Off on Just Keep Swimming – Finding Dory, Now on DVD/Blu-Ray/Digital HD is Fun for the Whole Family! Almost Christmas follows a dysfunctional family gathering together for their first Christmas since their mother died. KIDS FIRST! Adult juror Juanita S. comments, “I enjoyed Almost Christmas because Christmas is my favorite holiday and it brought back memories of my family’s gatherings. I could identify with Walter Myers (Danny Glover) in his attempt to bring his somewhat dysfunctional family together at Christmas time and his desire to honor his deceased wife and preserve some traditions. I feel traditions are special. What is not appealing is the suggestive material, drug use violence and profanity.” KIDS FIRST! 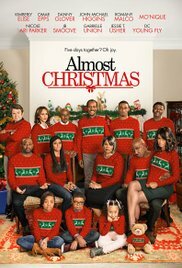 Film Critic Morgan B. adds, “Almost Christmas is a heartfelt story about a family at Christmas time. The comedy is well thought out and the story line is terrific. This film is perfect for families who are enjoying the holiday season with each other.” See their full reviews below. Almost Christmas is a heartfelt story about a family at Christmas time. The comedy is well thought out and the story line is terrific. This film is perfect for families who are enjoying the holiday season with each other. The film is more about family than Christmas. There is no caroling, present wrapping or cookies. We just watch family members trying to find ways to put their differences aside and get along. The all-star cast is magnificent particularly Danny Glover as Walter, Gabrielle Union as Rachel, Mo’Nique as Aunt May) and many more. My favorite scene is when the uncle (J.B. Smoove) decides to fix the outdoor Christmas lights on the house and the kids watch him. After his wife warns him to get off the roof and let someone else fix the Santa Clause, he falls off the roof and lands on his face. This scene made me laugh so hard especially when the kids got out their phones to record it and post to their social media. I adore Mo’Nique as Aunt May. She was adventurous and always willing to try new things even when the rest of the family is not. She doesn’t put up with any jazz from the four adult children. She is brutally honest and very humorous. She is the one who makes sure the family sticks together like glue. All Walter (Danny Glover) wants for Christmas is to have his four children get along for five days. Walter is not quite sure how to do this because his wife usually dealt with such things, but since she is no longer around he finds that he needs to step up and make Christmas fantastic for his family. The only problem is that the children don’t get along with each other all that well. The message is about families getting along. This family wants to spend their first Christmas together since their mother passed away, but families can be difficult. The message, beautifully demonstrated throughout the film, is that families should spend more time together and enjoy this time together. I recommend this film for ages 13 to 18 because there is some drinking and some profanity. You should also know that this film discusses loss and how it hurts so it might not be appropriate for everyone. Other than, that this film is family friendly with great humor and story line. I give this film 5 out of 5 Christmas Carol stars. This film opens in theaters on November 11, 2016 so go check it out. I enjoyed Almost Christmas because Christmas is my favorite holiday and it brought back memories of my family’s gatherings. I could identify with Walter Myers (Danny Glover) in his attempt to bring his somewhat dysfunctional family together at Christmas time and his desire to honor his deceased wife and preserve some traditions. I feel traditions are special. What is not appealing is the suggestive material, drug use violence and profanity. Almost Christmas opens with a journey of the Myers’ lives and brings you to witness the five days before Christmas. It moves quickly and I did not understand some things in the beginning of the film until later. Walter Myers lost his wife the previous year and attempts to bring his family together for the upcoming holidays. Will they survive? The behaviors modeled by the characters are a mixture. Walter Myers is a man who worked hard and provided for his family, wife, two daughters and two sons. He is having a difficult time dealing with the loss of his wife and is unaware of the struggles his children are having. Cheryl (Kimberly Elise), the oldest daughter, pretends that her life is perfect when, for real, her marriage to Lonnie (J.B. Smoove) is one affair away from being over. The youngest daughter Rachel (Gabrielle Union) is trying to get through law school while dealing with a recent divorce and struggling to get by. Christian, the oldest son, is happily married with two great kids but is obsessed with his political campaign. Evan (Jessie T. Usher), the youngest son, is in college and is currently fighting an addiction to painkillers. One of my favorite parts is the heartfelt conversation between Aunt May (Mo’ Nique) and Walter (Danny Glover) over a piece of sweet potato pie Walter bakes. Aunt May lets him know not only does he love and care for her sister, his wife, but he also allows her to pursue her life and career. Almost Christmas displays perseverance with Walter Myers’ attempt to make a sweet potato pie as good as his beloved deceased wife. It has many comedic elements throughout. Director David E. Talbert use multiple themes of loss, financial struggles, parenting and divorce as vital roles in developing the story. Almost Christmas has colorful visuals, especially the costumes of Aunt May which are beautiful and look fabulous o her. The music is fun and memorable, the locations are quite realistic locations and the emotions the film evokes resonate with most of us. I give this film 4 out 5 stars and recommend it for 14 to 18-year-olds as well as adults. You can see Almost Christmas at local theaters beginning Friday, November 11, 2016! When Canterlot Highschool goes on a trip to Camp Everfree, they are surprised to find a magical force is causing strange things to happen around camp. 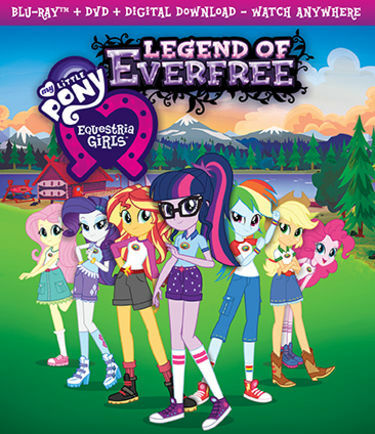 With the help of the Mane 6 and especially Sunset Shimmer, Twilight Sparkle must confront the dark Midnight Sparkle within herself and embrace her newfound magical abilities to save the camp. KIDS FIRST! Film Critic Morgan B. comments, “This film is one of my favorites of this series. I love the story line and how it fits perfectly with the rest of the series.” See her full review below. My Little Pony has caught up with sci-fi and now has dimensions where the ponies are teenagers. WOW! This is an awesome concept! I love this colorful DVD with its amazing storyline, fantastic characters and terrific animation. This film is one of my favorites of this series. I love the story line and how it fits perfectly with the rest of the series. The animation is fantastic. I love that they mix it with a little bit of Japanese anime. It really brings this film to life. The cast is so fun and entertaining. Twilight Sparkle (Tara Strong) is a loving main character. She shows this by helping her friends and trying to find ways to make the world a better place for everyone. She does this despite the fact that she is dealing with her evil dark side that came out in the last film. Plus, things at Camp Everfree are going wrong and strange things are happening all around camp. 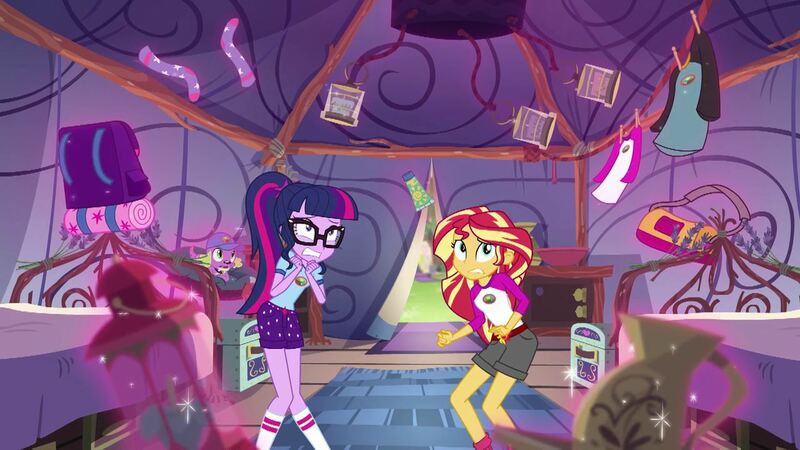 Sunset Shimmer (Rebecca Shoichet) is thoughtful, generous, wants to help everybody and wants to solve the mystery. She also helps Twilight Sparkle overcome her fear and gain more confidence about herself. Rainbow Dash and Applejack (Ashleigh Ball) is daring, adventurous and a total tomboy. She tries to do the most outrageous and dangerous stuff with her friends including rock climbing and archery. Applejack is brutally honest and cares deeply for everyone. She can be a bit mean at times, but she just wants you to know the truth about everything. She once told Rarity that her idea of a runway was dumb because they were in a forest and no one but her would use it. Pinkie Pie (Andrea Libman) is hyper and loves to throw parties anywhere, anytime and any place. She brings marshmallows to everything to make s’mores. She tries her best to be fun and bring life to the party. She even dares Rainbow to eat as many marshmallows as she can fit in her mouth in one bite while they are telling scary stories by the campfire. Fluttershy (Andrea Libman) is shy, quiet and loves animals with all of her heart. She even goes to help a bird get back into its nest when she is in a hurry. Rarity (Tabitha St. Germain) loves to sew clothes for all her friends and is a complete girly girl at heart. She even wants a runway where she can show the other campers the clothes she has made. Sunset Shimer is my stand out character. She wears a crown that has a spell cast on it and ends up with a demon inside her that she must fight off. Her character is compassionate. I like that she is always battling her caring side against her evil side. She is thoughtful of others. The way she tries everything in her power to help Twilight Sparkle overcome her fear is a great reminder to take good care of your friends and family, which is the theme of this film. You are currently browsing the KIDS FIRST! News weblog archives for November, 2016.